Labor Union's face constant challenges. Growing and maintaining membership is an uphill challenge for traditional organizations. The key to maintain membership and expand is to evolve to incorporate today's technology and visual branding techniques to enhance communication for current members and outreach initiatives. This creates visual appeal to tell your story to new potential members. 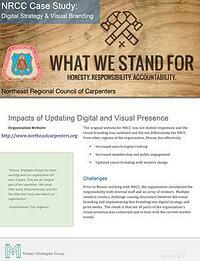 Read how our team assisted the Northeast Regional Council of Carpenters to update their visual branding, communication tactics, and digital strategy. Sign up to read the union membership case study.